After 5 years of drought--one for the record books, no less--the pendulum has swung far to the other side. After more or less normal rainfall in November and December 2016 (5.10 inches as per the UC Davis Weather Station), the floodgates opened wide in January, with no end in sight. In January we had 13.30 inches of rain, and in February 6.90 so far (February 1-18). That's a total of 20.20 inches for the first seven weeks of 2017; essentially the same amount we had during the entire 2016 calendar year (20.07 inches). Virtually all of our succulents are planted in well-draining soil (garden soil heavily amended with inorganic materials such as pumice, lava rock or small gravel). 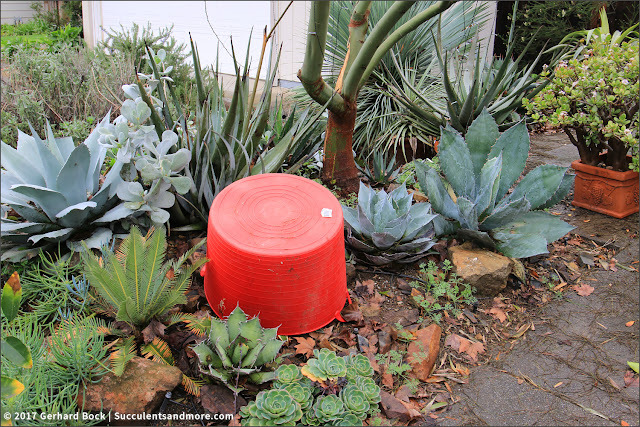 This has allowed them to withstand months of wet soil. So far we haven't had any plants rotting from the bottom up. But the 25.30 inches of rain that has fallen since November has had a damaging effect in other ways. A few agaves and aloes have started to rot from the top down. 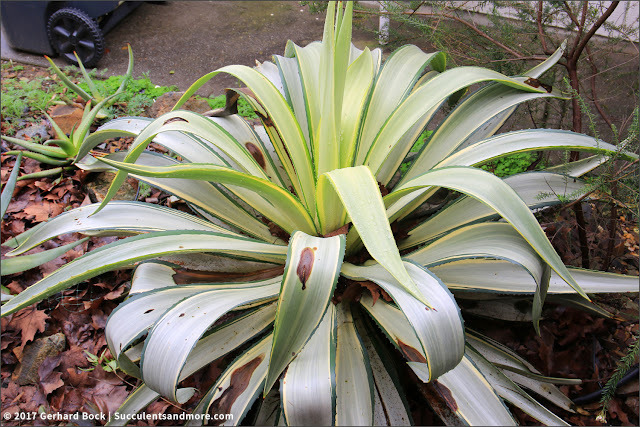 The first major victim is a beautiful Agave pumila in the front yard. I blogged about it on January 31 in this post. 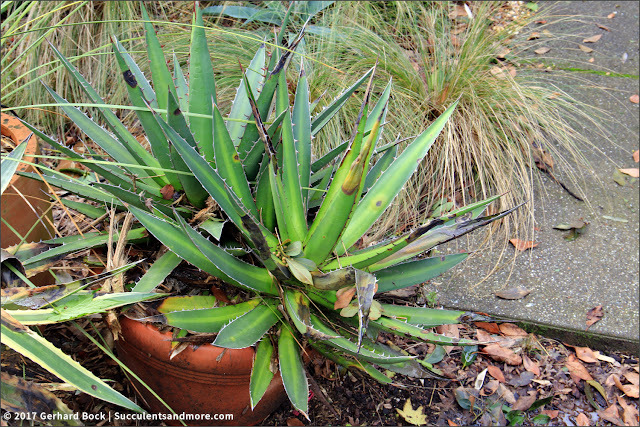 I had every intention of doing what reader Daniel had suggested--dig it up, treat the infection, dry it out, pot it in soil with little to no organic content--but never got around to. But I did spray it with a fungicide called Daconil and have been protecting it against the rain since then. 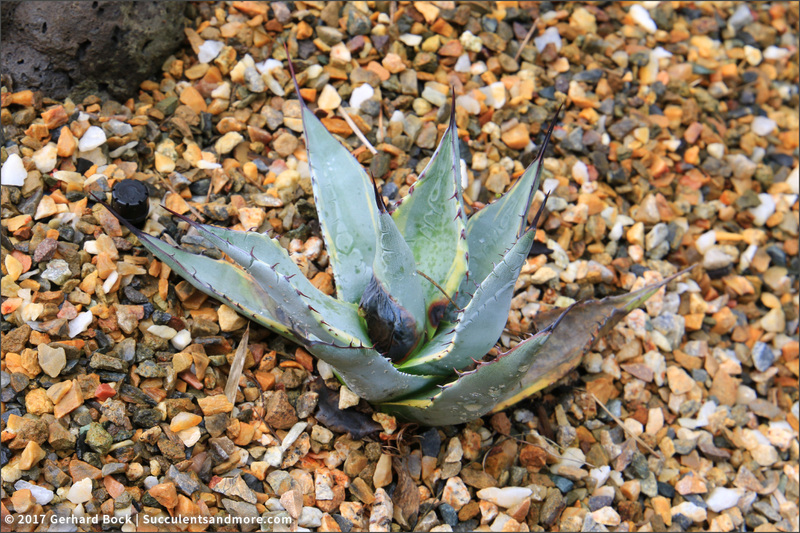 I remove the pot on dry days to allow air and sunlight to work on the lesions but I'm not sure that this Agave pumila will survive. It, too, has developed rot. It sprayed it with Daconil in hopes it will stop the spread. 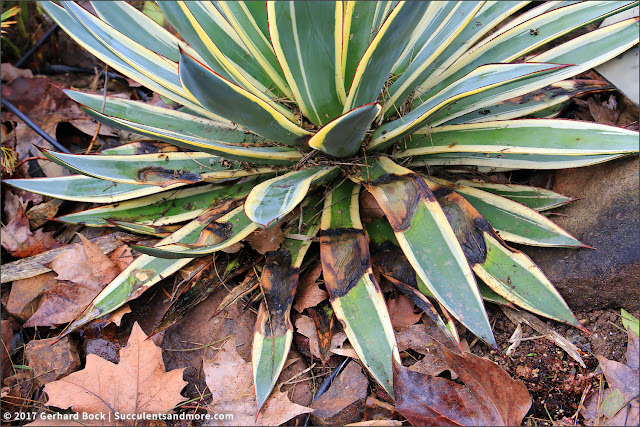 Two other agaves near 'Sunspot' are showing signs of rot on the lower leaves. This is Agave 'Mad Cow', a hybrid between Agave colorata and Agave bovicornuta. 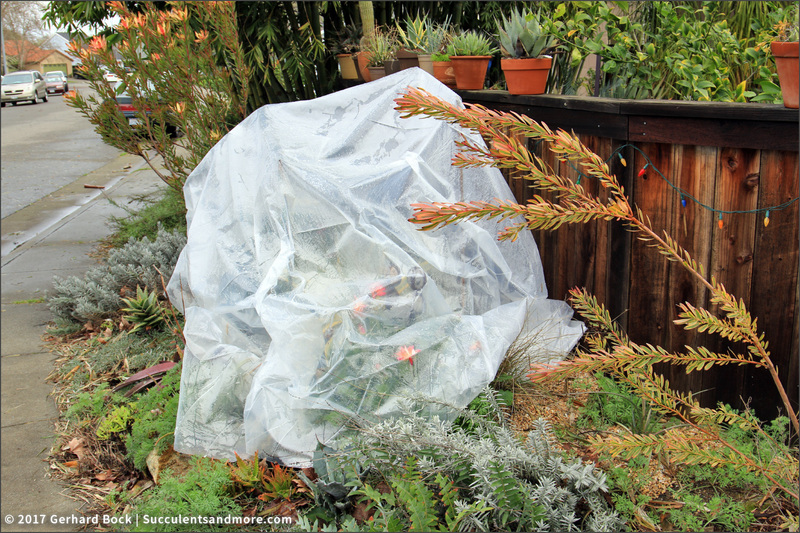 The shelter keeps the rain out but allows enough air in so the plants underneath the plastic don't suffocate. But when the sun comes out again, I need to take the plastic down. Otherwise it will get too hot inside. Aloe hereroensis. It got bruised during the removal of the 'Aristocrat' pear in the backyard and then nipped by frost. That made it susceptible to rot during the never-ending rain. 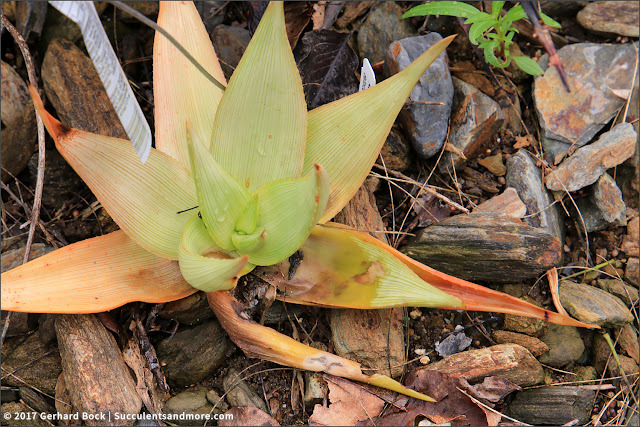 It was going to bloom for the first time this year, but this flower will never open up. 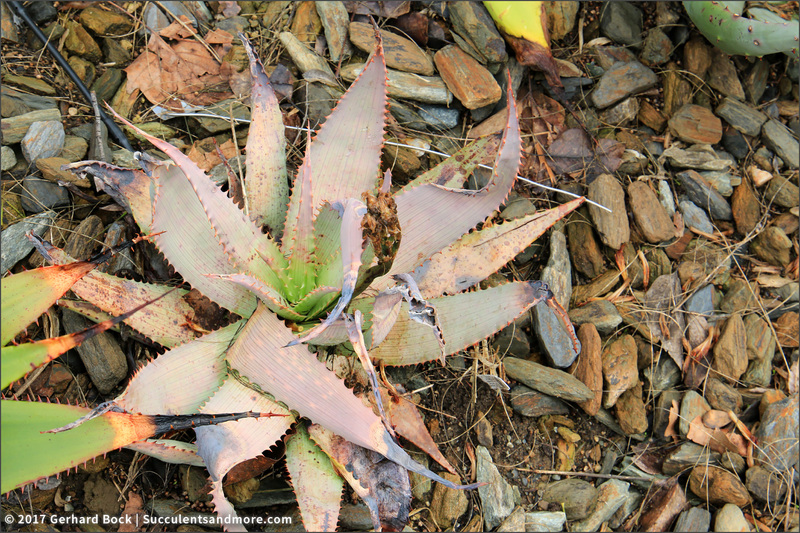 My other Aloe hereroensis are fine. 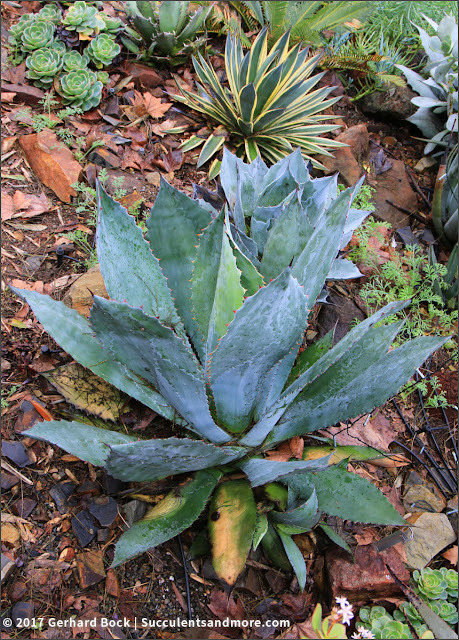 Agave parryi ssp. neomexicana 'Sunspot'. The rot has reached the center. I sprayed it with Daconil, but the prognosis looks dire. Stapelia gigantea, rotting in a pot. It's a goner, but I'm hoping the cuttings I took will make it. 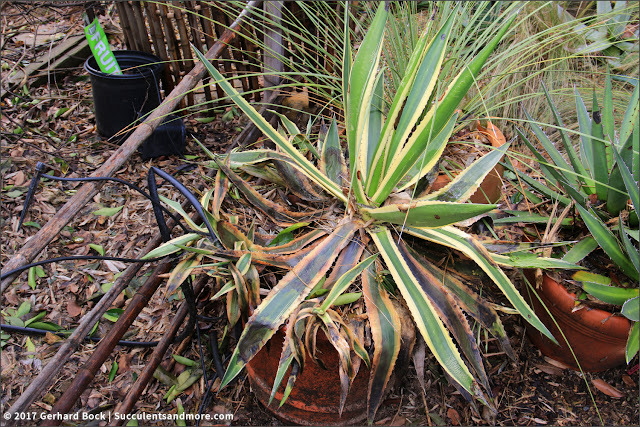 Most plants in the backyard are safe, but a few agaves in pots have rotted so much that I'm not sure they will survive. 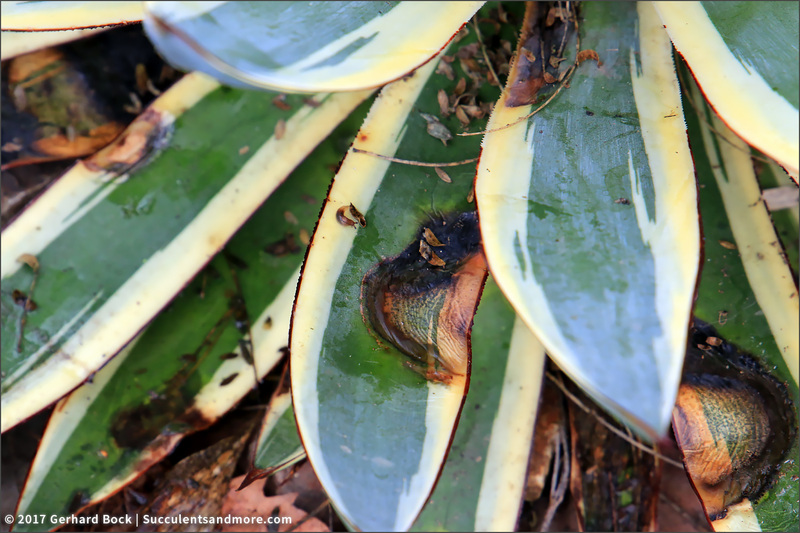 The first two you see below, Agave lophantha 'Quadricolor' and Agave ghiesbreghtii, sustained leaf damage when a nearby clump of 'Alphonse Karr' bamboo was removed in December. 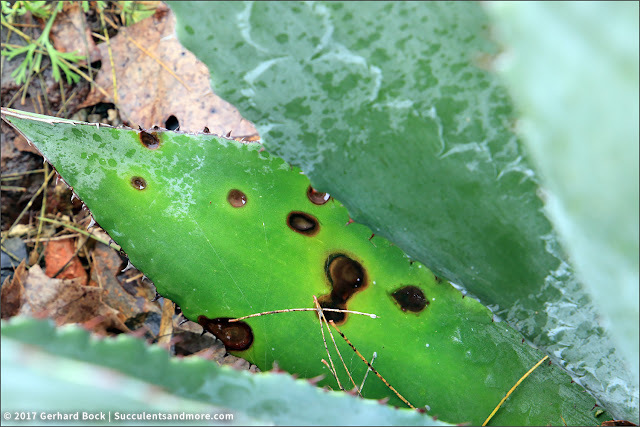 The wounds weren't able to heal because of the rain, allowing rot to develop and rapidly advance. It looks shocking, doesn't it? 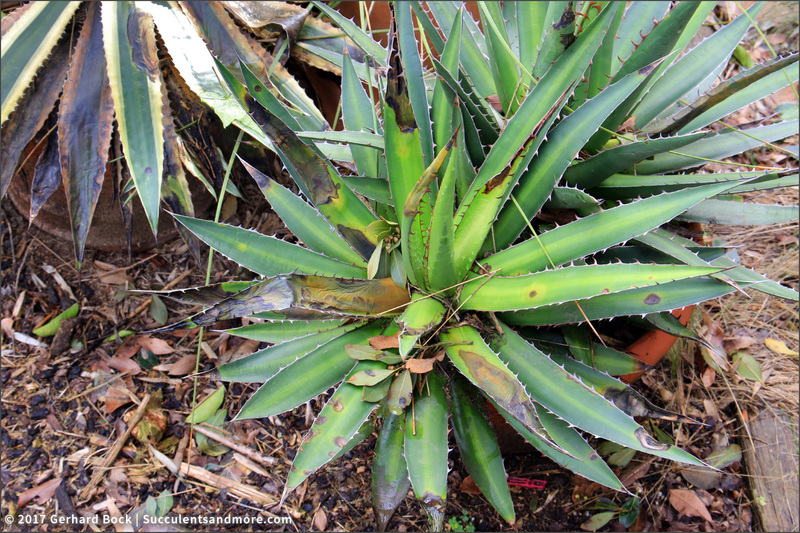 I've given up on this agave. I'm only keeping it around to see how far this will go. 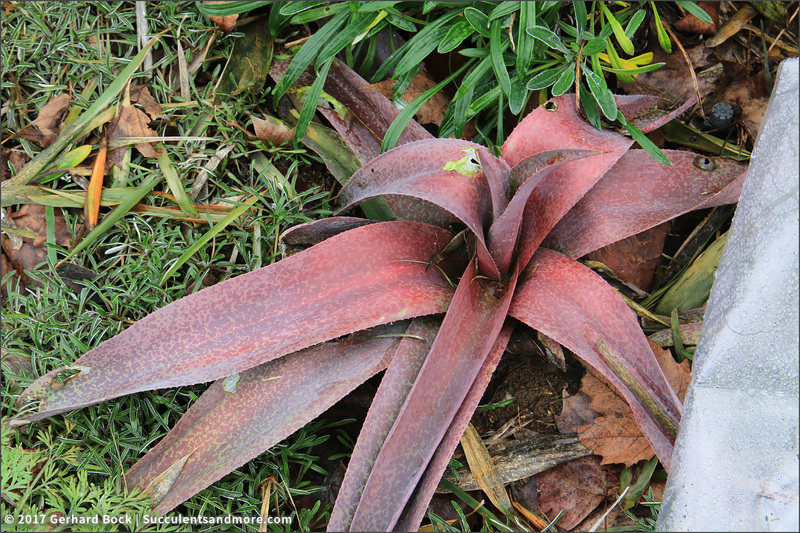 I have plenty of Agave lophantha 'Quadricolor' pups to start from scratch. Agave ghiesbreghtii looks better. I'm hoping it will pull through. The regular blue form of Agave americana seems impervious to the rain, but 'Mediopicta alba' appears to be susceptible to rot. 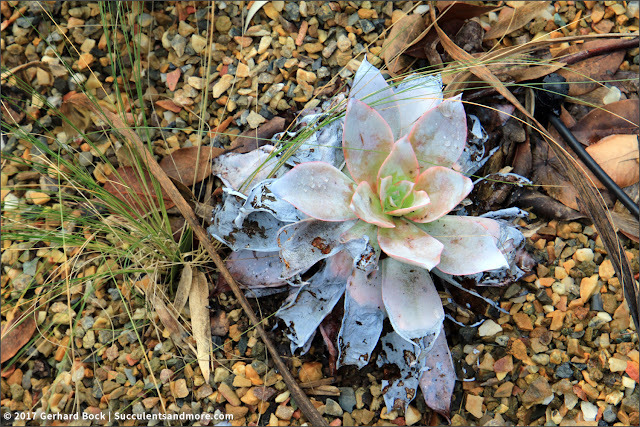 And finally my favorite echeveria, Echerveria cante. It looked great not long ago but the rain has finally taken its toll. I will dig it up, clean it, and leave it on the porch for now where it will be protected from the elements. But as bad as these images look, the majority of our succulents are fine, with no signs of rot. I'm keeping my fingers crossed that it will stay that way. And that we will finally have a few weeks of dry, sunny weather. Oh, these pictures are gasp-inducing. I'm so sorry it looks like you're going to lose so many plants. Ouch! I hope things dry out soon. We should have a few dry days starting tomorrow. But another inch of rain in the forecast for the weekend. 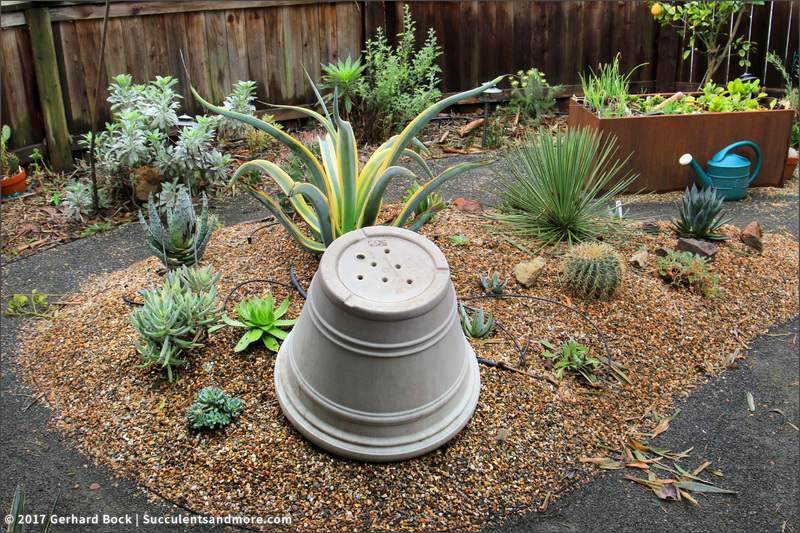 If this continues, I'll be covering a lot more plants when it rains. We're at just over 18", which is awesome. Everything looks okay here, a black spot or two, but not near the base. Or it would except for hail damage. Lots of little dings. Still I would rather have the rain than not. In the grand scheme of things, having all this rain is a blessing. I just wished it were spaced better. The soil in the Central Valley is so saturated, it simply cannot absorb any more rain so it simply runs off. 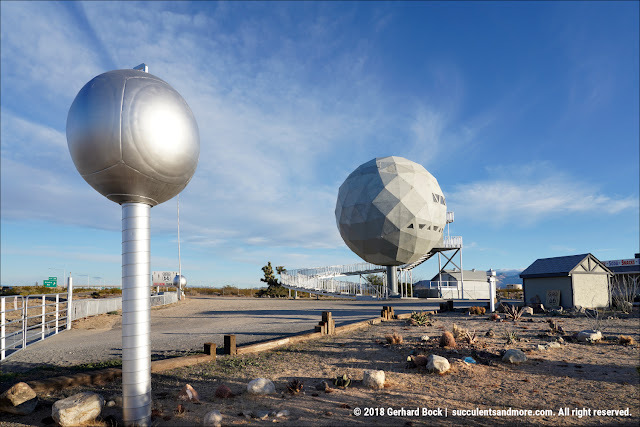 Wow Gerhard, that was painful to look at ! I hope you end up with some survivors from this bunch. I'm actually much less upset about this than I would have thought. Qué será, será. I'll simply get replacements. Yes the downside of all this rain. 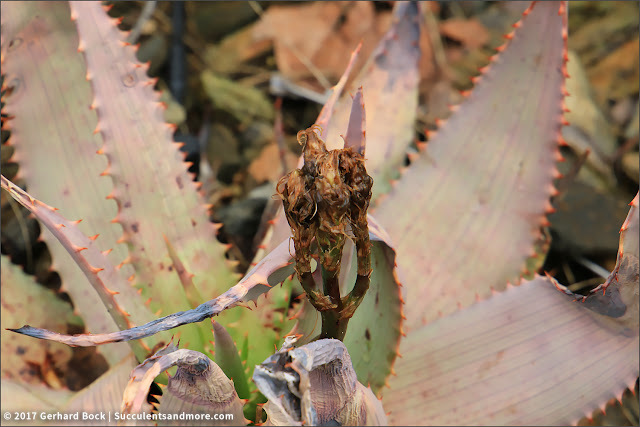 So far no issues with any Aloes, but Echeveria 'Afterglow' and several Agaves don't look good here either. On the flip side, I'm surprised how well Echium wildpretii is handling the rain. I have even more seedlings coming up! 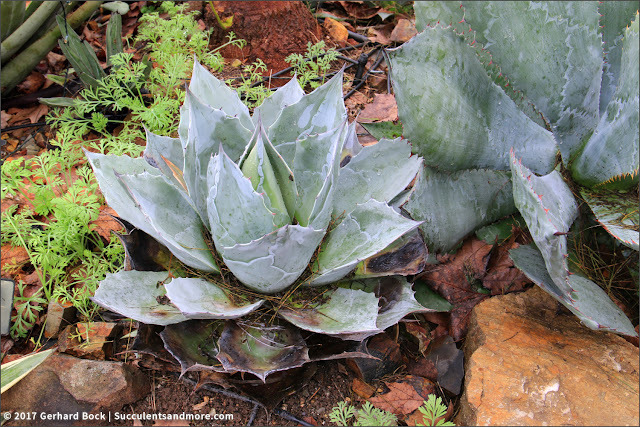 I know you have a lot of agaves and this group represents only a percentage but this presentation was painful. I haven't seen any widespread problems yet but, the more rain we've received, the more nervous I've become. Our rain total has passed 22 inches here. 22 inches! That's impressive. So the distribution between Northern and Southern California is pretty much equal now. I'm so sorry! This winter has been just insane, for so many of us. 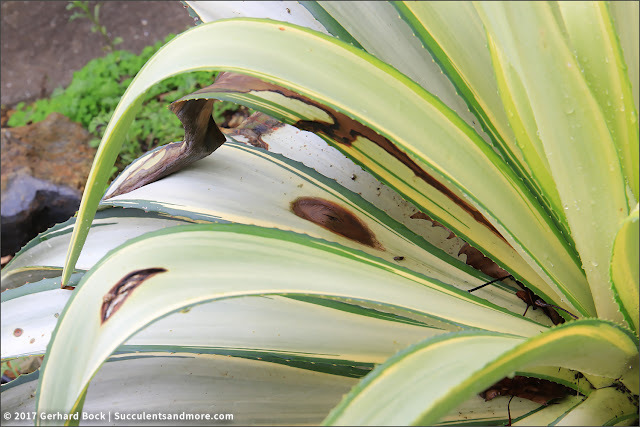 This is hard to look at, all your beautiful plants, and you, suffering. 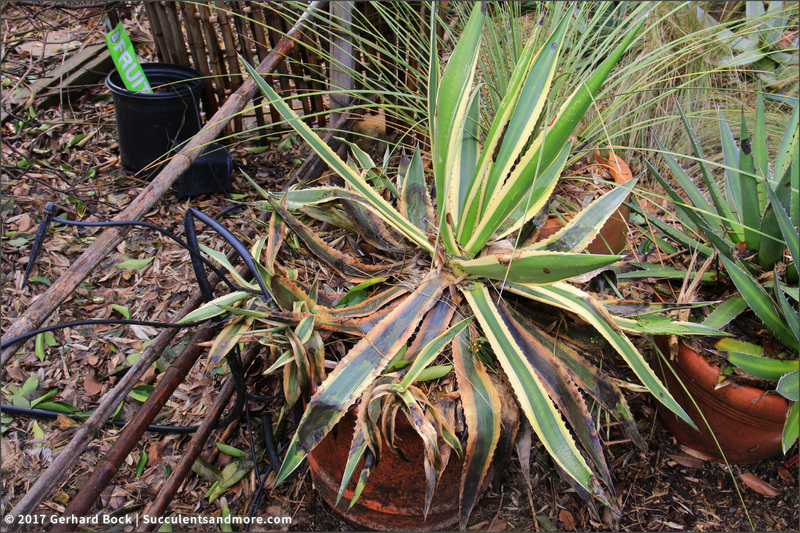 Sadly the big Agave lopantha 'Quadricolor' you gave me when we visited back in 2014 is rotting too, and it's been under cover. I have another pot of 'Quadricolor' with countless offsets. I'll be happy to give you another pup or two or three. Tough to see. To be honest though it just knocks you down to the level of us who grow in succulent unfriendly climate, at least for a little while. I don't know if I've ever had an agave that was unblemished. I guess it's reminder that they're just guests in our area as well. Meh--I'm sorry you're having to go thru this. 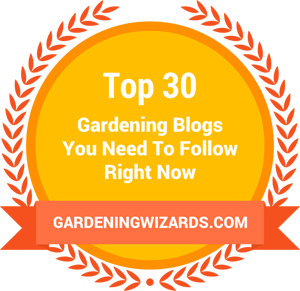 It looks like you're doing a great job saving your favorite ones & keeping tabs on things! Glad to hear that most of them are ok. 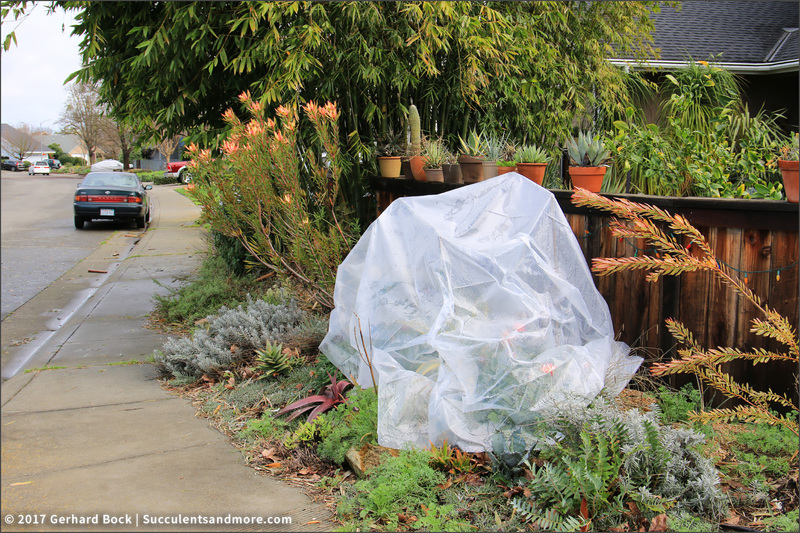 I'm trying to do what I can, short of covering the whole yard with plastic :-). I am seeing the same thing here in Roseville. Very sad but really nothing we can do. Hoping the rain stops for a while and let's things dry out. The weeds are running amuck also. Even though I put down preen. Looks like a lot will need to started over in the spring. Let's not even talk about weeds!!! Yes, lots of work for the spring but in a way I'm looking forward to it. I'm going a bit stir crazy with all the rain. 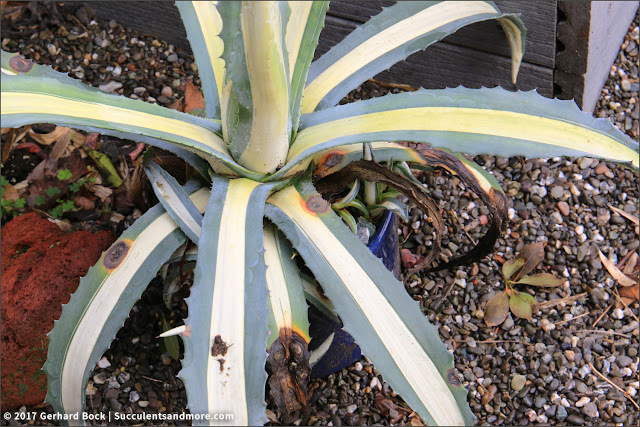 I'm in Los Angeles and a couple of my agaves and echeverias have rotted. It hurts. Sorry for your losses. I'm hoping to cheer myself up with some succulent shopping if/when it ever stops raining. Mother Nature, I propose a new rainfall schedule: 2 days of rain, followed by 7 days of dry sunny weather. Can we give this a try please? I've also seen the most damage to my Agaves. 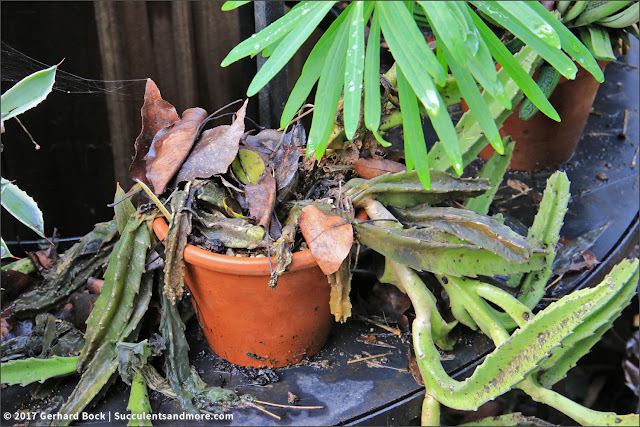 It's like they hit the max amount of rain they could take and it sets off rot very quickly. Mold growing on the lowest Echeveria leaves too on a couple plants that have gotten an aphid attack at the same time, on the flower stalks. Mold! AARGH. Where will it end? 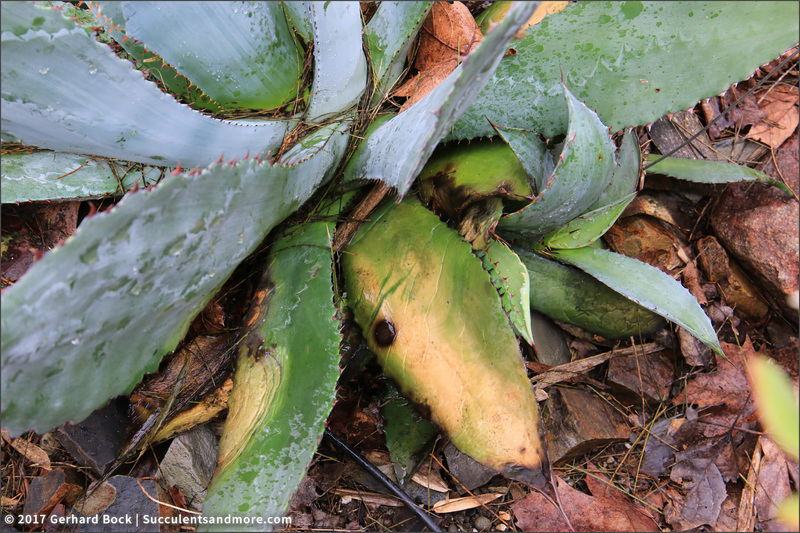 How are the plants at the Ruth Bancroft Garden handling all this rain? 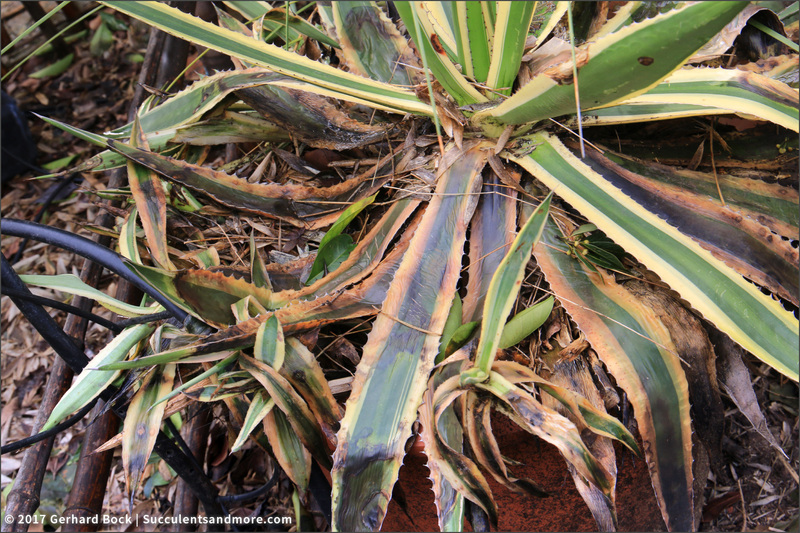 It seems the mature agaves are doing fine, but smaller, newer agaves show some blackened leaves at the bases that may or may not spell doom. I finally pulled out an octopus agave mid garden that showed the most stress, but the 'Stained Glass' under the pergola seems to have the best of all worlds -- good light and fairly dry. So sorry about the damage, esp. that pumila. Denise, what you said makes perfect sense! 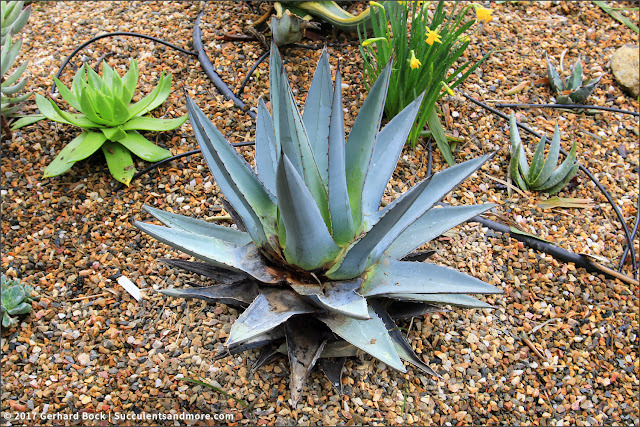 As for Agave pumila, I think it was Hoover Boo who said a while ago that A. pumila is sensitive to moisture in its crown so it should be planted at a slight angle. Will do that next time.